Today we are excited to announce that the Wealthfront FDIC Insured Cash Account is available for everyone! Over the last few weeks our clients have enjoyed earning 2.24% APY on their cash and now you can, too. Our cash account is the ideal complement to our long-term investing and financial planning and a great way to address your short-term goals like creating an emergency fund, saving for a car or even a home. Not only does the Wealthfront Cash Account pay 2.24% APY, but it’s FDIC insured for up to $1 million. That’s nearly 20 times the interest rate and 4 times the insurance you receive at a traditional bank. Why Don’t I Already Earn Interest on Money in My Bank Account? Great question. Unfortunately, banks love revenue. In 2018, the four largest banks in the U.S. made over $300 billion in revenue while your deposits just sat in your checking and savings accounts and earned almost nothing — your money makes money for your bank while doing nothing for you. What do you get in exchange? Overdraft fees, account maintenance fees, and confusing services that force you to go into a branch or dial a call center. Not exactly an equal relationship. The line graph is shown for illustrative purposes only. 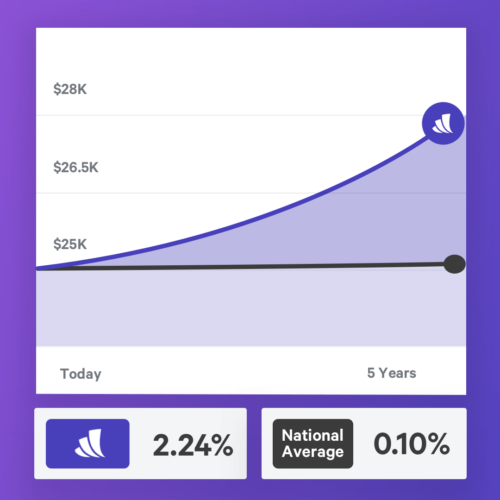 The line graph shows the growth of your principal over a 5-year period, and assumes that the APY for both the Wealthfront cash account and the national average remains the same for each year during this period. At Wealthfront, you are at the center of everything we do so we give the interest back to you versus gobbling it all up like the banks. According to the Wall Street Journal, there is $8 trillion in cash sitting in commercial banks. If consumers moved that cash to a service like Wealthfront instead, that would mean an additional $170 billion in consumers’ pockets. Imagine the impact that could have on people’s lives. It really is as big as it feels. Let’s face it. Opening a new financial account is a chore and often involves that dreaded thing: picking up the phone and calling customer service. So when we designed our cash account we made it incredibly easy to open, so you have no excuse not to put your money to work. Our clients have been incredibly delighted by the ease and speed. But don’t take our word for it — here is some of their own feedback. If you haven’t gotten around to opening a Wealthfront investment account or the recent market has you hesitant to invest, we get it. Our cash account is the perfect introduction to Wealthfront and a great place to stash your cash until you’re ready to invest for the long term (but really, there’s no time like the present to invest). And you only need $1 to open an account. Unsure How Much to Hold in Cash? Do you have that lingering feeling wondering, “Do I really need this much cash sitting here?” Or, “Is this enough cash for my needs?” Well, wonder no more: with our new cash account, you’ll also receive free financial advice. Answers to over 10,000 financial questions, without ever having to pick up the phone or schedule a meeting. We want you to know which trade-offs are right for you so your money ends up in the most appropriate accounts. Depending on your unique goals and time horizon, we’ll recommend how much to save — and in which accounts — to help you build exactly the life you want. We’re a company that is focused on continuously delivering our clients more value through innovation. What does that mean for you? You can rest easy knowing that every service you sign up for with Wealthfront will keep getting better. Specifically for our cash account, we will be adding the capability to move money from your cash account to your investment account, a debit card, and the ability to direct deposit your paycheck. So open a Wealthfront Cash Account and start earning 2.24% APY on your cash today. 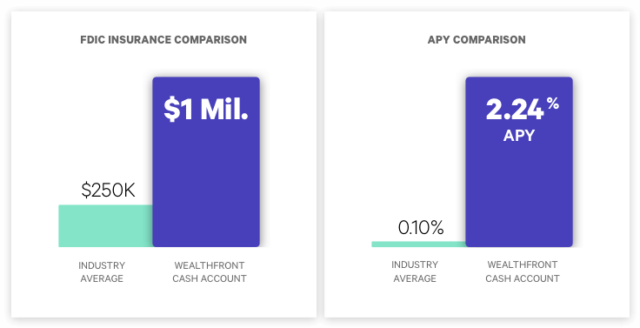 The Annual Percentage Yield (APY) for the Wealthfront Cash Account is as of March 18, 2019. The APY may change at any time, before or after the Cash Account is opened. The national average according to Bankrate: 0.10% APY, as of March 18, 2019. Cash Account is offered by Wealthfront Brokerage LLC (“Wealthfront Brokerage”), a member of FINRA/SIPC. Neither Wealthfront Brokerage nor its affiliates is a bank. The cash balance in the Cash Account is swept to one or more banks (the “program banks”) where it earns a variable rate of interest and is eligible for FDIC insurance. FDIC insurance is not provided until the funds arrive at the program banks. FDIC insurance coverage is limited to $250,000 per qualified customer account per banking institution. Wealthfront uses more than one program bank to ensure FDIC coverage of up to $1 million for your cash deposits. For more information on FDIC insurance coverage, please visit www.FDIC.gov. Customers are responsible for monitoring their total assets at each of the program banks to determine the extent of available FDIC insurance coverage in accordance with FDIC rules. The deposits at program banks are not covered by SIPC. The testimonials provided above by cash account clients may not be representative of the experience of other cash account clients, and there is no guarantee that all cash account clients will have similar experiences. This is not an offer, or solicitation of any offer to buy or sell any security, investment or other product. Investment management and advisory services are provided by Wealthfront Advisers LLC, an SEC registered investment adviser, and brokerage related products, including the cash account, are provided by Wealthfront Brokerage, a member of FINRA/SIPC. Wealthfront Software LLC (“Wealthfront”) offers Path, a software-based financial advice engine that delivers automated financial planning tools to help users achieve better outcomes. Wealthfront, Wealthfront Advisers LLC and Wealthfront Brokerage are wholly owned subsidiaries of Wealthfront Corporation.